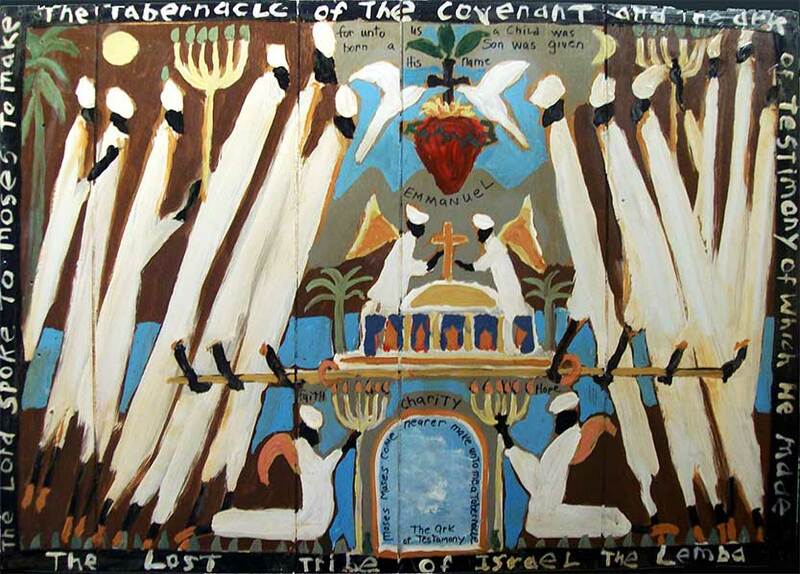 The Tabernacle by Bill Hemmerling ca. 1980. Compassionate Lord, give me a thankful sense of the Blessings in which I live, of the many comforts of my lot; that I may not deserve to lose them by Discontent or Indifference. Be gracious to my Necessities, and guard me, and all I love, from Evil this day. May the sick and afflicted, be now, and ever thy care; and heartily do I pray for the safety of all that travel by Land or by Sea, for the comfort & protection of the Orphan and Widow and that thy pity may be shewn upon all Captives and Prisoners. Above all other blessings Oh! God, for myself, and my fellow-creatures, I implore Thee to quicken our sense of thy Mercy in the redemption of the World, of the Value of that Holy Religion in which we have been brought up, that we may not, by our own neglect, throw away the salvation thou hast given us, nor be Christians only in name. Hear me Almighty God, for His sake who has redeemed us, and taught us thus to pray. 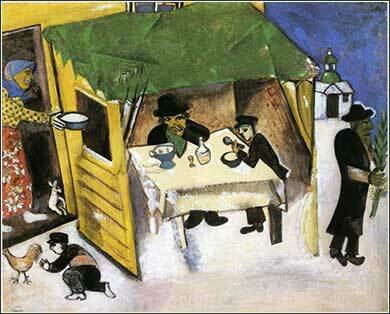 The Feast of Tabernacles by Marc Chagall, ca. 1916. Make the Tabernacle from ten curtains of finely woven linen. Decorate the curtains with blue, purple, and scarlet thread and with skillfully embroidered cherubim. These ten curtains must all be exactly the same size—42 feet long and 6 feet wide. . . .
For the framework of the Tabernacle, construct frames of acacia wood. Each frame must be 15 feet high and 27 inches wide . . . .
Set up this Tabernacle according to the pattern you were shown on the mountain. . . .
For the inside of the Tabernacle, make a special curtain of finely woven linen. Decorate it with blue, purple, and scarlet thread and with skillfully embroidered cherubim . . . .
Then put the Ark’s cover—the place of atonement—on top of the Ark of the Covenant inside the Most Holy Place. . . .
By way of introduction, most Christians do not know what "tabernacle" actually means. A tabernacle is a framed tent used for worship. The word, however, was borrowed by Christians looking for a term to describe more generic places or items of worship. The Jews retained the original meaning, and the Jewish "Festival of Tabernacles" involved going to Jerusalem and living in a framed tent for a week. The original tabernacle is described in Exodus 26. The Israelites, who will wander in the desert for the next forty years, are going to need a place to worship this great God, with whom they have made a covenant; for their relationship with God has become the center of their lives. They can hardly have a permanent structure; and so, their cathedral is a tent . . . but what a tent! It was surrounded by a fabric fence roughly one-half to one-third the size of a football field. The tabernacle proper was about 45 feet long and 15 feet wide and was divided into one large room and, at the back, a smaller room for the Ark and the Holy of Holies, separated by embroidered curtains. The framework was made of wood covered in gold, with silver supports, and the coverings were embroidered and made of the finest materials available. The covering was in three layers: an outer layer of a special waterproof animal hide; a second layer of goat hair for warmth; and a finely decorated interior layer. The chapter tells us that there were plans for the tabernacle which were not included in Exodus; in other words, as long and detailed as the description in Exodus 26 might be, they had even more detailed plans, given to them by God on Mount Sinai. The tabernacle would always be oriented east to west and would become the literal as well as spiritual center of Hebrew life, as the people's dwelling tents would form concentric circles around it. And God, whether literally and symbolically, lived within in the inner room. We must remember, though, that the Israelites lived by faith as much as we do, for they never saw the Ark. Only one priest, one time a year, would enter the room to sprinkle the blood of atonement on the cover of the Ark; at all other times it was hidden from view, for it was wrapped securely for travel. And even the high priest would never see the contents of the Ark: the tablets of stone, Aaron's rod, and the sample of manna. So the Hebrews were in the same position as we are today, even though the Ark was physically present. They were expected to live by faith, based on words of eyewitnesses passed from generation to generation and, eventually, written down.